My name is Fay and I am married to Gordon. I am 80 years old. Gordon is 88 and the patriarch of the Longstaff clan in Australia. Until early in 2014, life for us had largely been a very comfortable existence, with a small, but close family, a few good friends, many friendly acquaintances, a few crafty hobbies, and basic good health. Gordon and I spent many years taking long caravan-based holidays around our vast island, and when finances permitted, a few overseas journeys, as well. We both took for granted our ability to plan the next adventure without ever anticipating a time when this would no longer be possible. Fast-forward to early 2014 and a birthday luncheon with friends in a favourite local eatery. Gordon suffered the first of what was to become many choking experiences. Scary, but eventually resolved without professional intervention. Medical consultations followed including x-rays, barium tests and an endoscopy, which showed nothing more than a small ulcer, which was subsequently treated successfully. During the following month, Gordon shrank before my eyes, losing 20kg (~44 pounds). On the next GP visit, this fact alone caused the doctor to take notice, and he referred Gordon to a speech pathologist and a nutritionist. All this time, no one even mentioned the word “Dysphagia” and when eventually someone did, we had to check the spelling. Now with a name, we could check for information on the Internet. Finally, a light was beginning to dawn. Our computer became our New Best Friend. Pretty soon it became clear that in Australia, or at least in the rural area in which we live, there is a notable lack of knowledge or interest in swallowing disorders outside of nursing homes. The USA, Canada and Europe, on the other hand, have widely acknowledged the subject. Through the Internet, our personal understanding of Gordon’s problem and my role in helping him maintain weight and health, we gained confidence each day. He still has no appetite or interest in eating. Who could blame him? His meals have needed to become less solid, smoother, and softer as time goes by. His fluid intake also needs to be encouraged (called nagging) and my kitchen ingenuity, never a strong point, needs a regular injection of inspiration. 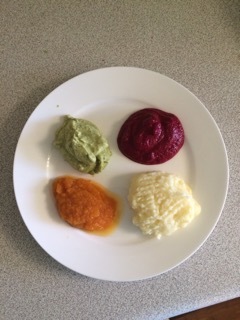 Many of these inspirations I gain from two wonderful American publications, “Soft Foods for Easier Swallowing”, by Sandra Woodruff and Leah Gilbert-Henderson, and “The Dysphagia Cookbook”, by Elayne Achilles. Recipes, Forewords, Prefaces and Introductions in each of these books probably saved my sanity. I’m also gaining confidence in translating American recipes into ‘Down Under’ equivalents. Gordon is remarkably accepting of his situation, rarely voicing his lost enjoyment of a rare steak, a barbecued sausage, a traditional roast dinner, or any of the other treats now beyond his ability to swallow. Although I try to serve colourful, flavoursome, separate serves, small and as inviting as possible, we both acknowledge that our lives will not return to previous normality. We could gripe, but we rarely do, preferring to dwell on the positive aspects with which we are blessed. Of course we are grateful that there is no serious cause for Gordon’s difficulties. Age is a factor we prefer to ignore. It’s wonderful that we still have friends and family in our lives, that we live in peace and security in this bountiful land, and of course, we are grateful that it’s possible to laugh and enjoy this new lifestyle in which we find ourselves. What a lovely, positive outlook you have, Fay. And you express it beautifully.